Nascent Surgical, LLC is the surviving entity resulting from a merger of Innovative Surgical Technologies, Inc. which contained intellectual property and Nascent Surgical, LLC which served as a focus for investment. The merger was completed on September 9, 2010. The purpose of the Company is to develop single use, disposable devices that improve the surgical environment, initially by eliminating surgical smoke that is produced in the operating room. Our offices are located at 6595 Edenvale Blvd, Suite # 140 in Eden Prairie, Minnesota, Zip code, 55346. The Company initially developed a cell foam-based technology that encompassed the operative site. A more recent iteration reduced the size without sacrificing functionality which no longer needs to surround the wound. The device attaches to a suction source by means of a 25 mm. I.D. corrugated tube which allows the smoke that is produced as a result of cutting and coagulation of tissue, to be removed from the operative site. The product called, “miniSquair,” is FDA registered and approved through the 510 (k) exempt process and the product was CE marked in January, 2015. Its earlier iteration called, “Squair,” underwent 1 -1 ½ years of clinical trials which resulted in revision of the initial design to better meet clinical needs. The miniSquair was tested at the University of Minnesota, Department of Mechanical Engineering, Particle Calibration Laboratory and found to be 99.5% efficient at capturing surgical plume. It has a small footprint and takes moments to apply by the nurse. Surgical participation is not required during its use. Other planned iterations include a “laminar” flow product that will add a layer of sterile air that flows over the open wound as well as incorporation of the technology into the surgical drape. Because the product can capture body fluids as well as surgical smoke, it will be made part of a fluid management system as a final stage of development based on a central vacuum system. Multiple patents for the fluid management system have already been issued while the design for its integration into a central vacuum system has been initiated. The product line should be complete within five to seven (5-7) years. Currently, we are in the introductory stage of development where the smoke capture design is completed, the pricing has been determined and the message has been made compelling because of newly performed and published research. The United States smoke evacuation market is currently at 20-25% penetration with an expected annual growth rate of 5-10%. By contrast, the Canadian market is 80% penetrated. The total market size for open surgical procedures, which our product addresses, is approximately 15,000,000 cases per year. We are new to this market but nevertheless, we have direct and independent representative sales throughout the United States. We have also initiated distributor sales throughout the Canadian provinces and anticipate sales in various European countries as well as New Zealand and Australia in 2016. At present, we do not have a national U.S. distributor. Our competition is established and includes companies such as Conmed, Buffalo Filter, Covidien, etc. all of whom sell the same smoke capture product which is an electrosurgical unit “pencil’ or “ESU pencil.” This product is limited in its capacity to capture smoke because of its embedded small bore tubing which can attain a maximum air flow of 11-15 cfm while effective smoke capture needs a minimum of 20-25 cfm which can only be achieved with a wider bore tubing such as a 7/8” I.D. hose which is attached to a suction source. The “pencil” is therefore minimally effective and needs to be hand-held during use which leads to hand fatigue. The single tube is also hand-held and kept within 2” of the smoke source in order to be effective but this limits surgical vision and requires dedicated personnel to chase the plume which is impractical. 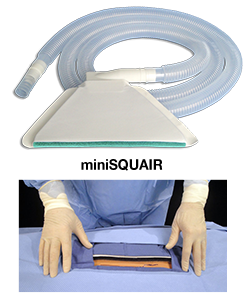 The miniSquair is applied directly to the patient, immediately adjacent to the wound and then attached to filter which, in turn is attached to a suction source without further personnel involvement. Our pricing is competitive to these less effective methods of smoke capture. Our competitive advantages include that we do not require the surgeon’s involvement, do not disturb his/her vision or their protocol and, most important, has been objectively tested to be 99.5% efficient at capturing smoke vs. the “pencil” tested at half that efficiency. By virtue of our efficiency, we are best able to safeguard the health of the operating team and their patients against the nanoparticles that comprise 80% of surgical smoke which are responsible for multiple systemic diseases when there is chronic exposure as occurs during the careers of the O.R. team members. They include neurodegenerative and collagen diseases such as lupus, various cancers as well as coronary artery disease and cardiac arrhythmias. The potential advantages to hospitals include decreased risk of disability and legal issues as well as the marketing advantage of a truly smoke-free hospital. It is also well known that clean air lowers absenteeism and improves work performance. Perhaps most important to the hospital’s administrators is the recent finding that effective smoke evacuation can prevent aerosolization of live bacteria within the smoke plume. The relationship between contaminated air and operating room surfaces to the rate of wound infection is self-evident and a recent focus at healthcare facilities. Multiple risks to success exist today but we have identified most and have been able to overcome them in turn. They include government roadblocks …we already have FDA approval for our products and have passed an FDA audit without any negative comments. Major distribution companies hold complex contractual arrangements with hospitals that increase the sales cycle but we have attempted to overcome that problem by persistence, compelling messaging, competitive pricing and an advantageous product. Imitation will no doubt follow our acceptance but we hold extensive intellectual property and continually add to our portfolio. Distribution is key and to overcome limited independent rep sales, we have turned to national distributors who have shown interest in nonexclusive distribution arrangements with us. We may be held up by lack of satisfactory smoke evacuators without sufficient power to maximize our smoke capture capability. An example is the Stryker Neptune device which has borderline suction power but other, more powerful units are available. In addition, we will have to partner with a central smoke evacuation company since ULPA filters, currently used to filter smoke, do not perform to specifications at clinically relevant air flow rates. Further, central evacuation systems reduce the cost of smoke evacuation/case by 50-55% by eliminating the need for costly ULPA filter replacements. They can also be modified for use for fluid management allowing our device to enter into a more lucrative market. One extraordinary opportunity that we are pursuing is the possibility that our product may actually be an infection control device as well as a product for smoke capture. Our recently completed experiments at Biotest Laboratories, a subsidiary of Steris corporation, suggests that effective smoke capture and suction prevents bacterial aerosolization.. These studies, through repetition, confirm our initial results boosting, the value of the miniSquair as a possible unique infection control device. Currently, wound infection that begins with wound contamination is a $1.4 B problem for hospitals because of a recent ruling of the Health and Human Services Administration which has declared that they will not pay for infections readmitted within 30 days of prior hospitalization. The team is led by Dr. Leonard Schultz who founded the Company, invented and later revised the product and developed all of the patents assigned to the Company. He worked as a general surgeon in the Twin Cities for 30 years during which time he was a leader in laser and laparoscopic surgery with worldwide credentials. He has authored book chapters and articles and holds over forty patents. He led his previous company, JLJ Medical Devices, Int’l, LLC to a successful harvest in December, 2009 when he sold the assets to Cooper Surgical, Inc. The product was the world’s first laparoscopic smoke filter. His team, until recently, included his son, Joseph Schultz who graduated from Macalester College in Saint Paul in 2006 with a degree in Economics, a year of law school at Case Western Reserve and an MBA from St. Thomas University in Saint Paul which he completed in 2009. He worked with Dr. Schultz since that time until this past February when he secured a position as financial analyst at a firm in Cincinnati. To date, the position has not been filled. The V.P. of Administration, Mrs. Jean Reavis, managed Dr. Schultz’ medical practice as well as JLJ Medical Devices, LLC from its inception in 2000 to its sale in 2009 and has managed Nascent Surgical since its beginnings. All members of the team are capable of cross-coverage but skilled consultants are employed as needed, primarily for regulatory issues such as CE Marking. Nascent Surgical, LLC is a design-specification virtual company. Product is warehoused on premises after it is manufactured by subcontractors. We remain the manufacturer of record. Our supply chain is established with our critical device made at Kent Manufacturing in Grand Rapids, Michigan, tubing comes from Global Med in Toronto, Canada, molded parts from Reflex Medical in West Saint Paul, Minnesota, assembly and packaging is done at I-Tek Medical in White Bear Lake, MN. Our product is sterilized with gamma radiation by Steris in Libertyville, Illinois. We currently have three full time employees. We sell directly to the health systems mentioned above but plan to work with national distributors as of 2016. We are seeking funds for inventory of the miniSquair, an aggressive marketing plan, additional prototyping of other product iterations, general operating expenses and merging of smoke evacuation and fluid management into a single entity based on a central vacuum system. We do plan on hiring at least two more employees to work with the distributors and their reps as well as expanding our presence outside the U.S. where we see a real opportunity now that we have obtained a CE Mark. We would be happy to answer any questions relating to individual investment opportunities. We can be contacted at info.nascentsurgical.com or at 952-345-1112. Due diligence will be required of potential investors. A minimal equity investment of $25,000 is required. Contact Nascent Surgical for more information.